Sample checks sent by scammers A list of recent Pet Care specific online scams received through email by PUPS members. Notice that the check is made to look like it has been sent by a legitimate business. You can look up this business online. Some businesses may actually be legitimate businesses (obviously the check is not actually from the legitimate business, it's spoofed with that business name). Others are just fake websites scammers have created to make it appear that the sending business is legit. They may include contact info on fake websites just in case you try and ask if the check is legit. Last edited by Forum Member on Mon Nov 26, 2007 5:08 pm, edited 1 time in total. OH MY GOSH!! You are such a detective!! I am impressed. What are you gonig to do with the checks? Are you going to turn them over to law enforcement? I was a potential victim of scam, but I caught on before it was too late. Supposedly I was going to be walking a German Shepherd for 3 weeks, the owner was coming to the States for business with his dog. Initially I was excited because this was going to be a big sale. He sent thousands of dollars more than what I was asking for. I took the money order to my bank, they called the credit union listed on the money order. 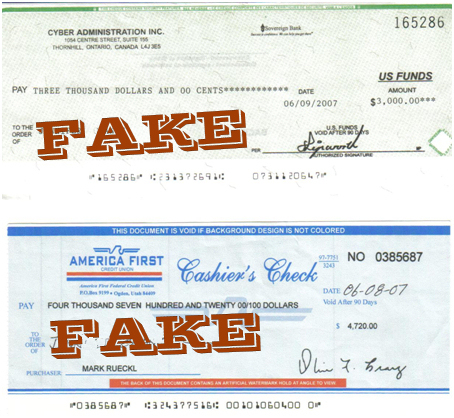 That credit union confirmed it was a fake money order based on the # that was written on it. I didn't confront him immediately. I led him to believe that I was naive enough to fall for his scam. I told him no one would honor the money order and that he needed to send me another money order. He then got back to me, informing me that his German Shepherd was killed in a car accident, along with the vet who was helping the German Shepherd!! I could NOT believe it. He then went on to tell me about how his family was going to sue him for not taking good care of the dog. I continued to lead him on, telling him how sorry I was about the death of his dog. He then got back to me and GET THIS...asked me if I could help him with his investments by giving him my Bank Account info!!! I finally confronted him on it, he denied it and have sinced received 3 emails of the same style, overseas coming to the States with their dog. This all took place shortly after I started my business!! So everyone, BEWARE of these guys, they're very persistant with trying to rob you! WOW. The Cashier's Check below that says Mark Rueckle with America First is the exact one I received, for $4,720.00. His name was Leit Luke and the "dog's" name was Bully. Probably the same guy since I see that you received a picture of a German Shepherd. I'm saving the money order as a memento! There's not much else that could be done, I contacted a few agencies who handle this type of thing, but this type of fruad is so rampant that I'm not sure if I'll hear from them. I also received emails from Twen and a cashiers check that was bogus. Told him I needed personal check or U.S. money order and he informed me that the dog had since died! Mark Ruekel was also name on my cashier's check!